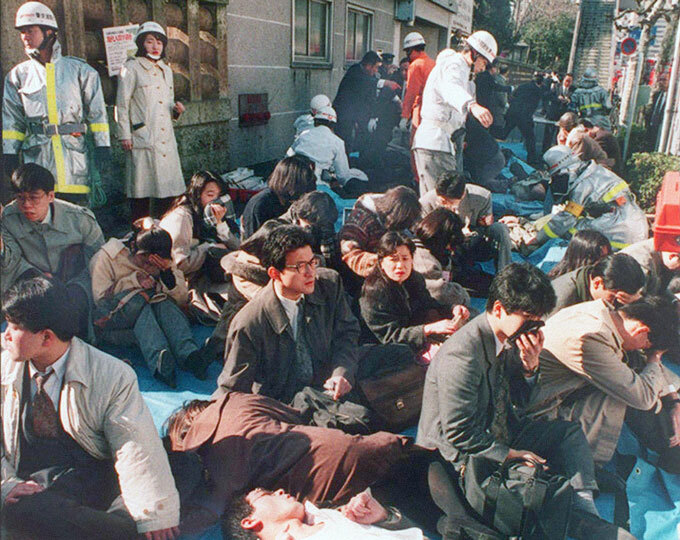 On 20th March 1995 terrorists from the Japanese Aum cult launched a co-ordinated attack using sarin nerve gas against commuters on the Tokyo subway system. Five two-man teams carried out the attacks. Each team consisted of a getaway driver and a subway rider. Four subway riders carried two double layered plastic bags and one rider carried three, each bag containing some 20 ounces of sarin. Five subway lines converging on the station of Kasumigaseki had been selected (where many Japanese government buildings and the Tokyo Metropolitan Police Department are located). At around 08.00hrs, during peak commuting time, the five assailants placed their Sarin filled bags on the train floor, pierced them with sharpened umbrella tips, and disembarked from the trains several stations away from Kasumigaseki. For unsuspecting commuters it was the ultimate nightmare. Inside the packed rush-hour underground carriages, passengers suddenly began coughing, choking and screaming. Witnesses later said that several subway entrances resembled battlefields as injured commuters lay gasping on the ground with blood gushing from their noses and mouths. The first emergency call was received by the Tokyo fire department at 08.10hrs, and before long, emergency medical authorities were inundated with calls for aid from multiple subway stations, where affected passengers were disembarking and seeking medical help. 131 ambulances and 1,364 Emergency Medical Technicians were despatched. 688 people were transported to hospital by emergency medical and fire department authorities. More than 4,000 people found their own way to hospitals and doctors using taxis, private cars, or on foot. The lack of emergency decontamination facilities and protective equipment resulted in a further secondary exposure of medical staff (135 ambulance staff, and 110 staff in the main receiving hospital reported symptoms). Having initially been misinformed that a gas explosion had caused burns and carbon monoxide poisoning, medical centres were informed that sarin had been identified. 12 heavily exposed commuters died. If it were not for the prompt and massive emergency response effort launched by the Japanese authorities, and the fact that the sarin used was only about 30% pure, owing to its hasty production for the specific attack, the incident could have been far more devastating. The attack demonstrated just how easy it is for any small group of terrorists, with limited means,to engage in chemical warfare. For most, the 20 March 1995 attack is the only act for which Aum is remembered. In actuality, between 1990 and 1998, Aum perpetrated more than two dozen significant incidents involving the use chemical or biological agents or the attempted acquisition of weapons of mass destruction. On several occasions Aum attempted to spread clostridium botulinum, the bio-toxin that causes botulism, and bacillus anthracis, the bacteria that causes anthrax, by using spraying devices coupled with vehicles or placed on the roofs of buildings. In 1992 Aum members travelled to Zairein an attempt to obtain samples of the Ebola virus for use as a biological weapon. Aum made several unsuccessful assassination attempts using VX nerve agent, sarin nerve agent, clostridium botulinum, and phosgene.